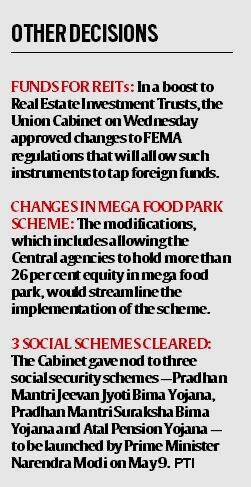 Until now, the Board had powers to recommend for investment approval of up to Rs1,200 crore. The decision will help in speedier clearance of foreign direct investment (FDI) proposals, one of the key concerns of investors. In a move aimed at boosting FDI inflows in the country, the Cabinet on Wednesday enhanced the powers of FIPB to take decisions on foreign investments worth up to Rs 3,000 crore, up from the Rs 1,200 crore allowed as per the FDI Policy, 2014. The decision will help in speedier clearance of foreign direct investment (FDI) proposals, one of the key concerns of investors. A senior official of the Department of Industrial Policy and Promotion (DIPP), who refused to be quoted, said that the move will help in clearing many stalled proposals while it will also increase the inflow of foreign investment. “The minister of finance who is in-charge of the Foreign Investment Promotion Board (FIPB) would consider the recommendations of FIPB on proposals with total foreign equity inflow up to Rs 3,000 crore. Recommendations of FIPB on proposals with total foreign equity inflow of more than Rs 3,000 crore would be placed for consideration of CCEA … This decision is expected to expedite the approval process and result in increased foreign investment inflows,” an official statement said. According to the extant policy, all the proposals above Rs 1,200 crore had to be referred to the Cabinet Committee on Economic Affairs (CCEA), while the finance minister cleared the recommendations of the FIPB on proposals with total foreign equity inflow of and below Rs 1,200 crore. The official statement said that the Department of Economic Affairs will process the recommendations of the FIPB to obtain the approval of the finance minister and the CCEA. The limit was last revised in 2010 when it was raised from Rs 600 crore, which was set in 1996. The FIPB is an inter-ministerial body chaired by secretary of the department of economic affairs and recommends overseas investment proposals to the finance minister for approval. During the April-February period of 2014-15, the foreign fund inflows have grown by 39 per cent, year-on-year, to $28.81 billion. “This is another way of us telling the world that India is an easy place to do business in,” the official said adding that this will lead to huge improvement in ease of doing business. Most of the sectors are presently under the automatic route, meaning only intimation is required to be given to the RBI and approval of the FIPB/CCEA is not required. No limit for foreign investment has been prescribed for the automatic route.